http://www.keralacm.gov.in/ is the official website of the Hon'ble Chief Minister of Kerala Shri Oommen Chandy. Kerala Chief Minister website is awarded Web Ratna Gold Medal by the Central Government from 7000 websites. You can watch 24 hours live telecasting of the Chief Ministers Office and Chamber through the Website. Givernement of Kerala had also developed a website http://www.oneyear.kerala.gov.in/ of the first Anniversary Celebrations which provides details of the Dream Projects of the Government, Welfare programmes etc. Citizens can Post a thought and win prizes in this website. Videos of various programmes by the UDF Government is available in the Chief Minister Website. You can also send money to the CM's Distress Relief Fund as Cheque or Demand Draft to the below address. You can contact the Kerala Chief Minister office using the below address, phone number or fax number or through the E-Mail address. People from Kerala can post their suggestions on Vision 2030 and it will be taken into consideration by the Government of Kerala. 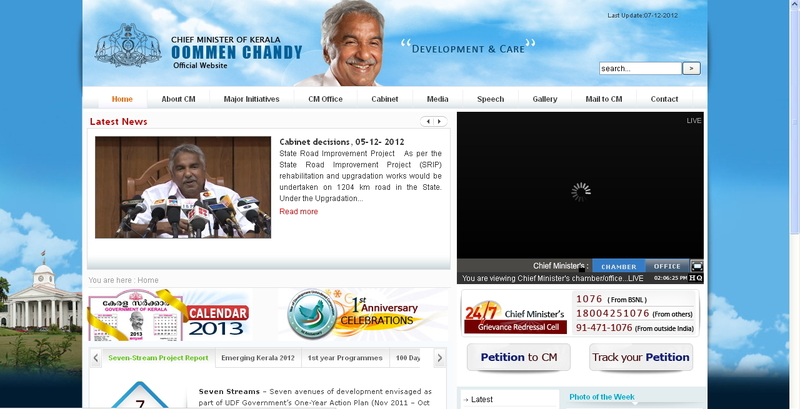 Citizens of Kerala can Register New Complaint through the CM Website by clicking on Petition to CM. Registered Petition can be also tracked through the website. Kerala CM website s a link between Government of Kerala and the General Public. Chief Minister Grievance Redressal Cell works 24 hours daily and can be contacted by calling 1076 from BSNL phones or call 18004251076 from other phone or call +91 471 1076 from outside India.